Το Ocean Partners Rebanga Namba Apartment, στην περιοχή Νάμπα σε Οζάκα, αποτελεί δημοφιλή επιλογή για τους ταξιδιώτες. Από εδώ, οι επισκέπτες μπορούν να έχουν άμεση πρόσβαση σε όλα όσα η πόλη έχει να προσφέρει. Με την βολική του τοποθεσία, το ξενοδοχείο προσφέρει εύκολη πρόσβαση στους προορισμούς της πόλης που πρέπει οπωσδήποτε να δείτε. Επωφεληθείτε από ένα πλήθος ασυναγώνιστων υπηρεσιών και ανέσεων σε αυτό το ξενοδοχείο της Οζάκα. Κορυφαία χαρακτηριστικά του ξενοδοχείου συμπεριλαμβάνουν τα δωρεάν WiFi σε όλα τα δωμάτια, προσβάσιμο με αναπηρικό καροτσάκι, κουζίνα, γρήγορο check-in/check-out, ασύρματη σύνδεση Wi-Fi σε δημόσιους χώρους. Ελάτε σε ένα από τα 15 φιλόξενα δωμάτια και ξεφύγετε από τα άγχη της ημέρας με μια ευρεία γκάμα ανέσεων, όπως επιπλέον τουαλέτα, προϊόντα καθαρισμού, τζάκι, λευκά είδη, καθρέφτης, που θα βρείτε σε ορισμένα από αυτά. Εξάλλου, το ξενοδοχείο διοργανώνει πολλά ψυχαγωγικά δρώμενα έτσι ώστε να έχετε πολλά πράγματα να κάνετε κατά τη διαμονή σας. Όποιος κι αν είναι ο σκοπός της επίσκεψης σας στη Οζάκα, το Ocean Partners Rebanga Namba Apartment είναι μια εξαιρετική επιλογή για μια χαρούμενη και συναρπαστική απόδραση. Η ιδιοκτησία βρίσκεται σε κατοικημένη περιοχή και απαγορεύει αυστηρά τα πάρτι και τον υπερβολικό θόρυβο. Η ιδιοκτησία δεν διαθέτει ρεσεψιόν. Οι επισκέπτες καλούνται να ενημερώσουν την ιδιοκτησία εκ των προτέρων σχετικά με την εκτιμώμενη ώρα άφιξής τους. Παρακαλείσθε να ακολουθήσετε τις οδηγίες που επισυνάπτονται στο email επιβεβαίωσης για την ομαλή διεξαγωγή του check-in. Η ιδιοκτησία δεν διαθέτει υπηρεσία φύλαξης αποσκευών. Κατά το check-in, οι επισκέπτες πρέπει να παράσχουν μία έγκυρη μορφή επίσημου πιστοποιητικού ταυτότητας (π.χ. διαβατήριο, ταυτότητα, άδεια οδήγησης κ.λπ.). The property does not permit the use of electromagnetic oven due to safety reasons. Η ιδιοκτησία απαιτεί ελάχιστη διάρκεια διαμονής ίση με 2 διανυκτερεύσεις. Apartment is clean. Happy that the toilet and bathroom is separate. The management has a file in the apartment explaining the rules and essential info (especially on how to lock/unlock the complicated looking :) lock on the main door). There is a launderette and convenience store downstairs. About 10min walk is the Shin-Imamiya subway. Many restuarants nearby too. We loved staying at this place because it was convenient and big enough for the both of us. We had some hiccups with our stay because of the typhoon but the owner worked with us and we enjoyed our trip with ease. It was kind of hard to not have a stove in there to save us money so we can cook but we managed with the things we had. It is a nice place, perfect for a couple but may be cramped for more than 3 people. GOOD -From this location can use 3 railways (Midosuji Line, Yotsubashi Line, Nankai-Koya Line) Very easy to travel. -Near(can walk) FamilyMart, 7-11, Lawson, 2 Ramen Restuarant. -The room is very clean. BAD - Only one thing, please change a contact in the "Check-In Information" to the official account, not a person. Because of my "Check-In Information" have to contact a person but she was already quit and she don't have any respond until 7 days before my flight. She gave me a LINE@-contact. But after all contact in LINE@ was very good and very fast response. SUGGESTION - Please print a paper about "How to lock the door?". It's hard for a first time. (pin > push > rotate) Next time, if I go to Osaka I will book this room again. The condo is a safe and comfortable place. Near Daikoku Station, one station away from Namba. The place is inexpensive and clean. The location is near with train station, convenience store and restaurant. Quiet place, clean and affordable. The bed is only enough for two peoples, but they provide futons. The facility is quite complete. Reccomended. The facilities are generally clean and good. I also love how the toilet is eco-friendly. The location is reasonable as well. It is located in a quiet neighbourhood and is 5 minutes walk away from the station. There are also nearby supermarkets that offer affordable food. The only problem I had was that the bed sheet was a little bit dusty. the place is pretty clean. the costumer service is quick and nice. and it's very convenient to take the subway(大國町) only take 1 station to なんば(難波) and 2 stations to 心斎橋. there's two family marts on the way from subway station to Rebanga Namba Minami. really had a great experience here. I will choose this place if I get to Osaka again. Chose this place as it was advertised on Agoda as being able to accommodate 3 people. Have never slept on futons but thought will give it a try. What a sham! A single bed, a folded/pullout sofa which would be sufficient for a 4 to 5 footer, a rolled up mattress and 2 futons (squeezed in the cupboard). All in a tiny room, together with 3 unnecessary and inconvenient small tables which we had to move around to find space for all 3 of us to sleep. The futons had to overlap!! Honestly, this place should have been advertised for just ONE occupant. AND Rebanga Namba owners, even public toilets in Japan have bidets and all the other functions!! A studio without reception and house keeping. Very near to Daikucho(Exit 4) station, just walk straight till Family Mart and turn right. Good for budget family. Cleanliness is not good as it should be. Good to stay, fit in better for 3 person. Clean and comfortable. But the aircond doesn't provide so much heater, feel so cold even the aircond heater was turned on. The toilet doesn't have a sink or hose pipe. Thank you for the feedback, About the heater thank you for the feedback, we will fix the problem as soon as possible. We are sorry for the problems you had at the property, we are working hard in order to improve the service and for better comunications with our guests. About the cleaning delay we were facing peak season and we will be more prepared for the next one, we will take in high consideration this feedback for our future guests. Room is tidy but relatively small, good for couples. We suggest to change the bed to a standard bed instead of sofa bed, which would have better quality of sleep. There is a famous ramen place and a family mart around the corner. 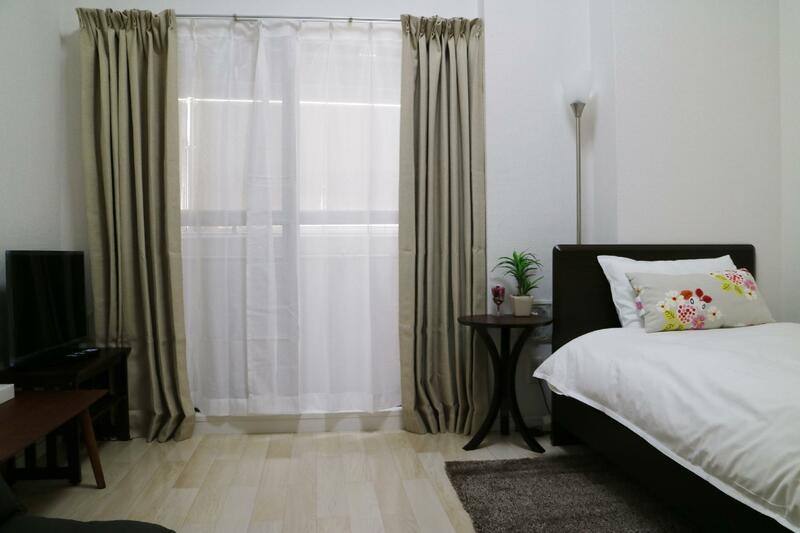 Convenience location, 5 mins walk to reach 2 supermarkets and both Daikoku-Cho station (Midosuji line) and Imamiyaebisu staton (Nankai Takano Line), 10 mins walk to Namba station. We chose to walk and explore the area, it took us about 30 mins to walk to Tennouji area. It would be a lot better if there is bicycle for borrowing or rental. Host is nice and fast responding. Nice clean and cozy apartment. Walking distance to Daikokucho station and Shin-Imamiya station if you're taking the Nankai airport express from the Kansai Airport. It's so good I actually have two reservations with this place on my upcoming trips. Apartment is located in a quiet neighbour hood and just 5 min from the subway. Conveniently located and there are some good restaurants nearby operated by the locals which we find more value for money compared to the ones in town. The contact person was very helpful and when we got into trouble with our locks, we are able to get help from her to resolve our problem. Thank you! I think I really love this apartment. Everything is very good. 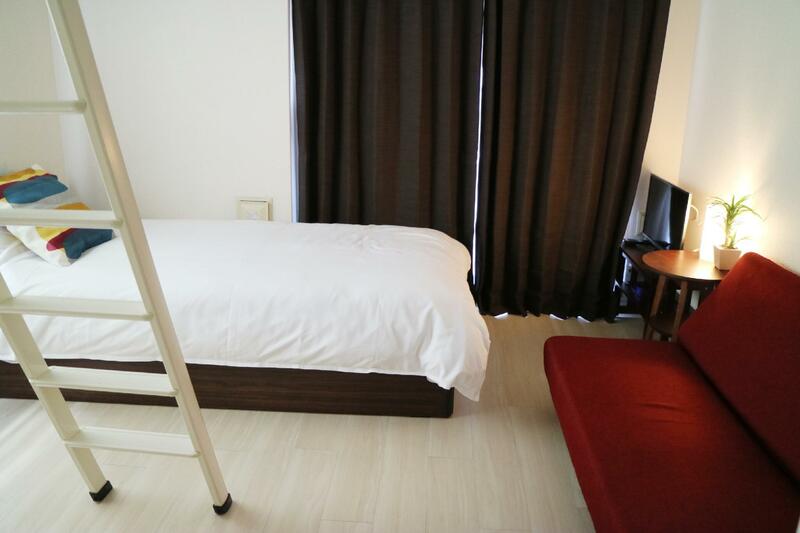 It is near subway station just walk around 5 mins and the room is very clean and large for 3 people to stay in. This room have a good manual about how to use the things in the room and how to walk from the subway station also the security of this apartment is very good too. Initially when we walked into the room, there were a lot of dust. The cupboard were full of dusts. The floor were not swept nicely and there were dusts and hairs everywhere. We have to do some cleaning ourselves since no room service provided. The towels provided were not really good towels and cannot absorb water. The tower also produced a lot of linen dust type. Kitchen utensils provided were also not to what we expected, only 3 bowls, 3 forks and 3 plastic glasses. So cannot cook. Limited restaurants around unless taking 15 to 20 minutes stroll down the street. Its quite near Nama, so After I went to there shopping and dinner, I went back apartment by walk. Many restaurant nearby the apartment so I can eat anytime I want. Room size is bigger than I perfer. The room was clean and cute design. SO I think they got some improvement about the cleanliness. Thanks for all previous, esp two Thai previous review. It was satisfactory to choose this apartment. Rebanga is located in the area easily to go everywhere and easy to reach sightseeing places. I recommend visitors to pick here. Σταθμός Υπόγειου Σιδηρόδρομου Daikokucho στα 0.26 χλμ.